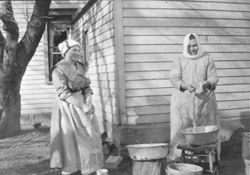 Description: Mrs. Karl Warkentin (maybe Elisabeth Warkentin 1890-1982) and Mrs. Ben Froese (Sara Franz 1882-1940) (mother of Mrs. Emma Peters) cleaning hog intestines for making sausage and liverwurst. 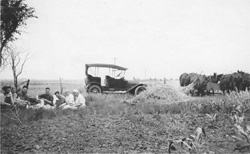 Used in Rhonda Hiebert, ed., 1888-1988 Buhler, Kansas, A Centennial History, p. 27. 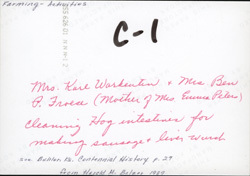 Description: back of 2008-0041; Mrs. Karl Warkentin and Mrs. Ben Froese (mother of Mrs. Emma Peters) cleaning hog intestines for making sausage and liverwurst. 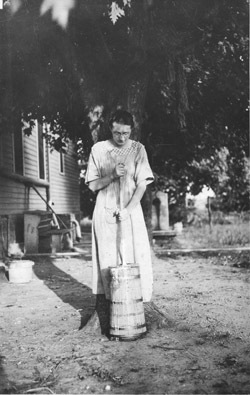 Used in Rhonda Hiebert, ed., 1888-1988 Buhler, Kansas, A Centennial History, p. 27. Description: "Harvest siesta." Left to right; Alfred G. Linscheid, John E. Linscheid, Edward W. Miller, Edward H. Linscheid, Peter R. Linscheid. Front of photo says "Camping" and seems to have a date of June 24. 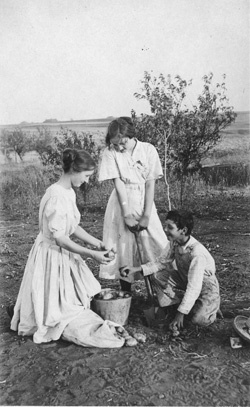 If it's the same year as several of the other photos in this sequence, it would be 1918. 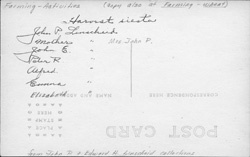 Description: back of 2008-0044; "Harvest siesta." 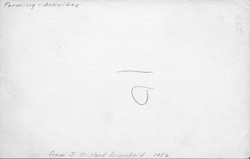 Left to right; Alfred G. Linscheid, John E. Linscheid, Edward W. Miller, Edward H. Linscheid, Peter R. Linscheid. 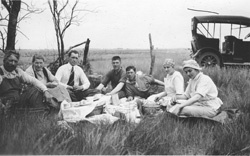 Front of photo says "Camping" and seems to have a date of June 24. If it's the same year as several of the other photos in this sequence, it would be 1918. Description: "Siesta." John P. Linscheid in straw hat, Katie Mueller Linscheid next to him. Front of photo says "Harvesting Spree"
Description: back of 2008-0046; "Siesta." John P. Linscheid in straw hat, Katie Mueller Linscheid next to him. Front of photo says "Harvesting Spree"
Description: Linscheid family harvest scene. Postcard. Description: Linscheid family harvest scene. Description: back of 2008-0055; Linscheid family harvest scene.